What do you get when you cross a Hamilton 662 movement with a Hamilton 667 movement? A Hamilton 690 movement... go figure. For a lot of people, a major "grail" of their collection would be a 1960 Hamilton Automatic K-475. In fact, as far as Hamilton watches go, it's one of the few models that is worth more today in inflation-adjusted dollars than it retailed for when it was new! It was produced for only two years, 60 and 61. They can be found for sale but they are very pricey. The K-475 is one of two Asymmetric models with automatic movements. It has a very unique case with swooping lugs with a texture that is echoed by the black and gold dial. 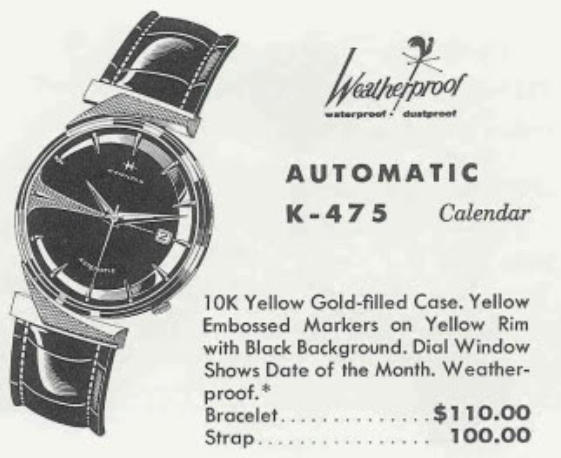 The K-475 is also unique because it is the last of three K-series models with a calendar complication. It also has the crown at about the 4.5 hour position, which is very similar to some of the popular Electric models. The K-475 came in a 10K yellow gold filled case and it wasn't a terribly expensive model when it was offered. In today's inflation adjusted dollars the $100 retail price equates to about $830 in 2017 currency. However, you would be lucky to find a decent K-475 for under $4,500 today... if not considerably more. Needless to say, the likelihood of me finding a K-475 at a yard sale is pretty low. So I have had to resign myself to the fact that I would never see a K-475 in the flesh. However, I recently had another collector ask me if I would take his on. After some back and forth, I somewhat reluctantly agreed to take it on. You see, the K-475 is the only model to use the 690 movement. It's a one-of-a-kind, sort of... as you'll see below. My project watch arrived in what can only be described as in "almost new" condition. Sure, it's been worn but it really looks solid. The dial is near perfect - although the original luminous paint on the dial and hands has faded. The case is a one-piece design - that's also unique among the K-series automatics. In order to open the watch I will need to remove the crystal. At this point there are beads of sweat on my forehead. The 690 movement is much thicker than the ETA movements used in the Accumatic line. Separating the two piece stem can be done by either levering the crown out and forcing the joint to separate or trying to blindly pivot the movement out without damaging the stem. Success... it turns out the entire stem just slid out. The set lever must not have been very tight. Now you can see that the back of the 690 looks just like the 667 movement used in the other K-series models in the 1960's. The rotor has a wide chamfer on the outside where a 661 rotor is more flat. I don't really know what to expect inside the movement so I will continue the disassembly in my camera light tent. That way if anything accidentally happens I won't lose any hard to replace parts. They will be easy to find in the white background of my enclosure. The back of the watch is very familiar. The first thing to come off is the oscillating weight. Now it looks like a 661 movement. The dial feet screws go in on an angle - that's different. With the dial removed, I can see the dial-side of the main plate is just like a 662 movement like used in the earlier Hamilton K-576 Calendar. Thanks goodness... I've seen this sort of complication before. 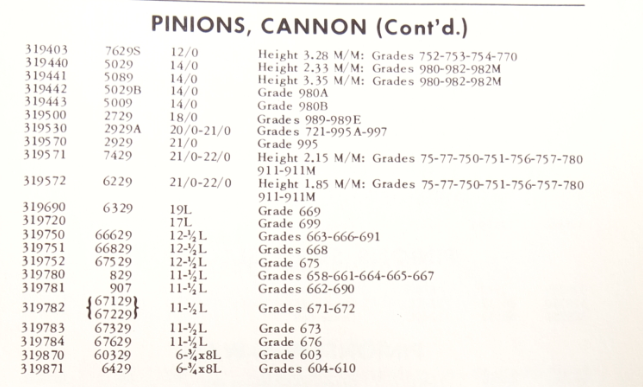 In fact, if you look at the Hamilton Parts Manual, the 690 shares a lot of parts with the 658, 661, 665, 667, etc. but it shares pretty much all of the parts with the 662; including a unique cannon pinion and sweep second wheel. Finding a donor 690 movement would be extremely hard - only one model uses it... this one. But finding a 662 is almost as hard; only two models used it... the K-575 and K-576. As fate would have it, I recently picked up a K-576 project watch with the 662 movement. Let's call that "plan B" in case anything happens to my project K-475. Continuing my disassembly, the first part off the front of the movement is the hour wheel - that's a unique part too, it has a gear underneath it to engage the date complication wheels. The cover comes off next. Three screws need to be removed. You can see there's a spring under it that pushes on the index lever that centers the date wheel. Now I can start to remove the various parts for the date complication. Since there's nothing holding the date wheel in place, it can be lifted straight up and off. Two screws hold the date advancing wheels in place. The one with multiple grooves is reverse threaded so instead of "lefty loosey" it's "righty loosey". The minute wheel and setting wheel come off and the movement is ready to be flipped over. Now the movement looks like your garden variety 661 movement. If you've followed my past projects you've seen this dozens of times. Phew! With almost all the parts safely removed I can go back to my regular work bench to complete the disassembly process. Reassembly is pretty straightforward... I just start with the back and work my way to the front. In order to reinstall the balance I need to reinstall the balance jewels. That's always fun - they are tiny and easily lost. Two sets of jewels need to go on both sides of the balance and they're held in place by shock springs. Here's a picture of the main plate with the jewels installed. I'd say there's nothing to complain about with this watch's performance. It might slow down a smidgen as it breaks back in though. I can put the automatic framework back onto the train bridge. Three screws will hold it in place. The oscillating weight can be installed next. It's back to the light tent to reinstall the parts on the front. I'm not taking any chances. Positioning the cover on the front is easy once I push the spring over so it's up against the index lever and not on top of it, as shown. There - I'm ready to put the dial and hands back on. The crystal that came with the watch is in good shape but there is something adhered to the inside of the crystal that I cannot remove. Since the dial is black, it's very easy to spot the imperfection and it's a tiny distraction. I can eliminate it by replacing the crystal with a fresh 30.6mm PHD crystal. A new crystal is an easy way to make a watch look much better. Darn... I let the watch run a while and it was about 5 minutes slow over 12 hours. The watch looks perfect on the timer so that tells me the "almost one of a kind" cannon pinion is too loose. It needs to be "just right"... not too tight and not too loose. I'll have to take the dial off again and remove the cannon pinion so I can tighten it with my staking set or I can try the cannon pinion from my project K576. Tightening a cannon pinion with a staking set is accomplished by placing the cannon pinion in a little guillotine-like stake and whacking it with a bladed punch. A couple of light whacks with a small hammer will dimple the side of the pinion and tighten it. That's the plan, anyway... what could go wrong? Of course, the trick is to not dimple it too much. So I pass a round broach through the pinion until it's barely loose. Then at least I know I won't crush it. You can see there's already a dimple in the side of the pinion and I'll use this as my target. This is the sort of operation where three or four light attempts is better than one hard whack. Here's a close up of the cannon pinion when it's reinstalled. It needs to be loose enough that I can set the time without stopping or jarring the train wheels. If it's too loose, the center wheel will slip inside the pinion and the watch will appear to run slow even though the watch is keeping perfect time. I can test the fit by trying to set the time. It should feel slightly tighter than before but not too tight. Well, I made it! The watch is back together and running as great as it looks. It's hard to take a good photo of a black-dialed watch so I resorted to a slightly angled shot. This watch looks awesome and would be the pride of any collection... any collection but mine that is. Unfortunately this watch is headed back home to it's owner. Of course, the good news is I don't have to sacrifice my 662 project watch and I can restore it instead. Those are arguably as rare as the K-475... too bad they're not as sought after. Terrific looking watch and another great job Dan ! As I was reading I was getting ready to e-mail you about buying it ! She's a beauty for sure. Amazing work as usual. Selling it would cover my son's room and board at college but I don't think it's owner would be happy with me! The K-475 is just gorgeous. With its original bracelet even more stunning. (A mint bracelet came up for sale today - for 'only' $995. Would be money well spent IMO). Where was this original bracelet for sale? Ebay?